So today in an effort to get my mind of things Mike and I decided to take the girls to brunch and a movie. Normally the idea of going to a kids movie on a Saturday afternoon makes me want to run screaming, but this week has really put some things in perspective for me. 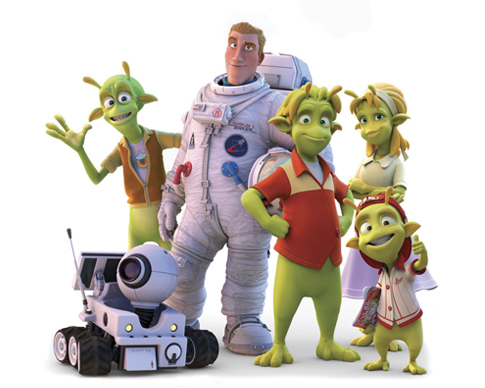 We chose Planet 51 over Christmas Carol – and I am SO glad we did! There were a few places that were almost TOO adult, but thankfully my girls didn’t catch them. But the best part wasn’t the movie. It was the lesson I learned while we were there. We got to the theater early thinking it would be packed since the movie just opened. Thankfully it wasn’t and we were able to get the “foot rest seats” – you know, the ones right behind the bars where you can prop your feet up without bothering anyone! Ha – you know which ones I am talking about! We exchanged a friendly smile and sat down. Well immediately Sami and her daughter began chatting. These two had never seen each other before, but in a matter of minutes were sharing each other’s candy. They whispered and giggled thru the entire movie – the mom and I making eye contact just a few times with smiles to let eachother know the girls were ok. When the movie ended, the girls exchanged phone numbers, and both went on their ways, happy to have made a new friend. It made me think about how easy it was to make friends at that age, and how “fearless” we are about talking to complete strangers. We don’t want to pick up that 600 pound phone. We over think the best way to approach someone – to the point we miss the opportunity and think “oh well, next time” – knowing full well we will wuss out then too. We don’t ask for the party booking. We don’t push just a little further to see how interested she is in the opportunity. We have forgotten what it is like to be a child, and to make friends out of no where, and to be fearless and confident enough in ourselves to make the first move. This week the question was asked how to get over this fear, and I responded with tips on how to get prepared for the call, have a script, blah blah blah…. but today I realized, we all just need to remember being little girls, making new friends, and sharing our candy. I believe we should never lose sight of our childhood, no matter how “old” we get. Our business is all about relationships, and making new friends. And we have so much to share – with our products, our hostess rewards to save money, and our opportunities to truly change someone’s life. I am so incredibly proud of my ‘Tween for making the move and introducing herself – my little Leader. Ahhh, the wisdom of a ten year old.